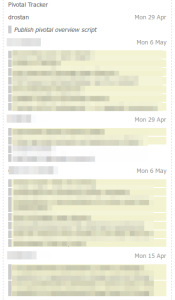 Pivotal Tracker is a great agile planning tool for “projects with issues”. But checking the various projects I participate in, just to see what we’re all working on, was a hassle. I wanted to have a quick overview: a list of the projects I’m involved in, and the current “stories” we’re working on in each of them. 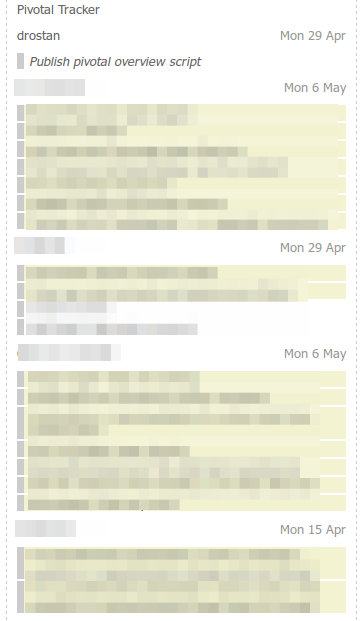 Sitting nicely next to similar other “to do” lists on my dashboard page. I found a PHP library that allowed me to quickly put together a script that does that. And not just that: since the script downloads the data from Pivotal Tracker, it also was quite easy to store that data and have a copy that I can include in my own backup scheme, to reduce the risk of loosing it all. It shows the description, and a list of the open tasks in the story as well. Projects and stories are also links, clicking them opens (the project or the story) in a new tab. If you think it might be useful for you too: the code is on github.